Home » Formats » EXCEL format » What is standard Working Procedure, and How to Write? The purpose of Standard Working Procedure is to ensure that all unified processes in workplaces functioning are carried out systematically, controlled and continual improving. In Organization, standard working procedure provides stable working system. Through the system, organization ensure that all interconnected activities, manufacturing and supporting processes are in various workplaces are carrying out systematically. Also ensure that organizational functions are under controlled conditions. By standard working procedure, we can improve quality of performance. Quality of performance is improve in quality by continual improvement which includes product and process quality. The standard working procedure can apply in existing system as the part of system. The process improvement of each activity provides path to each employee through inserting proper guidelines, instructions and procedure guidance. This procedure can apply to all the activities, administrative and statistical, mathematics analysis in the workplace. Organize customer orders / job order evaluation. Work / Job allocation – Work order / job slip generate. 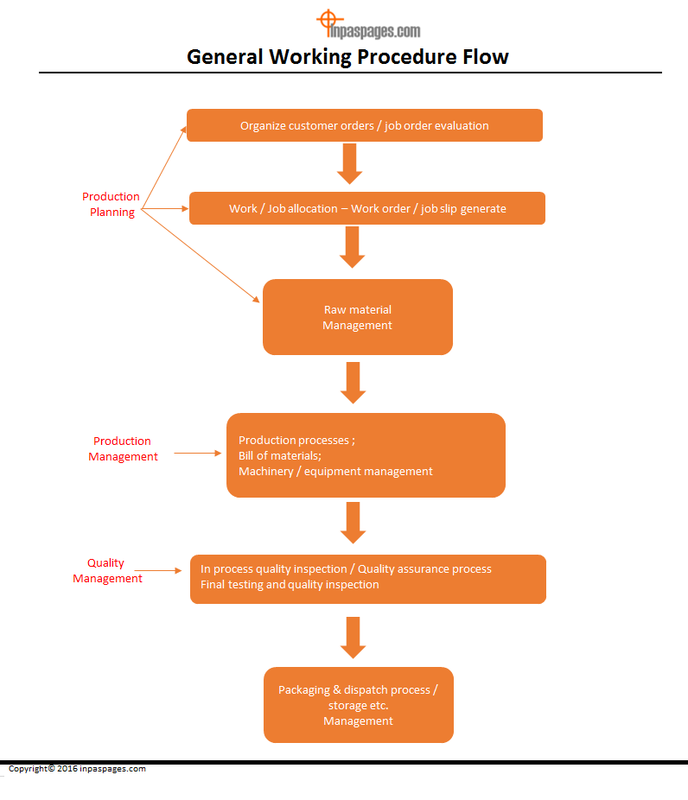 Production planning – raw materials management. Production processes / bill of materials and machinery / equipment management. In process quality inspection / Quality assurance process. Final testing and quality inspection. Packaging and dispatch process / storage etc. The general process sequences of manufacturing are manage such as communication, document and sharing depending on the procedures. Hence the standard working procedure is establish, manage and update according to internal system needs. To effective management for improvement of continual improvement of quality, require proper documentation. Data recording and reporting are also important part that describe overall activities, processes and its communication. The analysis processes & related activity’ data recording are manage as per management assignment. Integrity & accuracy should maintain at all the time. Data reporting and its verification are conducts as per internal management system of the organization. There is no any specific system to individual point out, but as per standards system that needs to manage data reporting and its verification to being in limits of standards system. Improvement of documentation system should be properly managed as company adopt standards system. The standard working procedure cover the storage requirements of documents. which may includes maintain and update of documents. The documentation system includes proper retention period, revisions and its update history, actual location, approvals and verification requirements.